There are quite a number of excellent blogs on The Healers website that deal with the importance of adapted nutrition in persons with ALS (PALS). Here I would like to share a personal example of the effects that a change in diet may have. Detrimental effects of sugar and other carbohydrates in PALS have been discussed previously and suggestions can be found in previous blogs. These all can be summarized as follows: don’t eat it! Avoid carbohydrates as well as you can. The reasoning behind this is that for almost five decades causes of ALS have been shown to be associated with disturbed metabolism of glucose 1,2. At least in some PALS, proportion unknown, physiological conditions prevail that appear somehow similar to type 2 diabetes. Glucose uptake from the blood into the cells is regulated by the hormone insulin and it has been found that numerous PALS display disturbed insulin secretion, insulin resistance of the cells (which means that cells can’t take up enough glucose from the blood), and consequently low glucose levels in the cells 3-6. To further worsen this situation the down processing of glucose into energy is also hampered. Thus, cells aren’t sufficiently able to satisfy their energy demand from carbohydrate-based food 7. It is not surprising that this may result in (or promote) neurological disorders like ALS when nerve or glia cells are affected. All cellular energy production, regardless of the food source (carbohydrates, fat, or even protein), boils down to the production of adenosine triphosphate (ATP). ATP is an energy-rich molecule that provides energy for almost all processes in the cells of living organisms. But unfortunately ATP is also an unstable molecule with a half-life of only 2-3 seconds and our body can’t store it for later use. Its continuous supply by the cell’s production machinery is therefore essential. Without this steady ATP turnover survival is not possible. It is estimated that the average total mass of daily ATP production in man sums up to half the body mass, i.e. a 70 kg person would produce (and consume!) 35 kg of ATP per day! To compensate for impaired glucose availability a metabolic switch from carbohydrates to lipids as the primary energy source can be observed in ALS models 7, which corresponds well to weight loss seen in PALS 8. From this it is easy to understand why carbohydrate-rich high caloric food supplementation will not lead to any improvement – it only adds fuel to the flames. It is, however, unclear, whether hypermetabolism observed in PALS is cause or consequence of poor carbohydrate processing 8. A possible way out of this vicious cycle from carbohydrate-based malnutrition and progressive cachexia is to restrict carbohydrates and to eat (much) more fat instead. 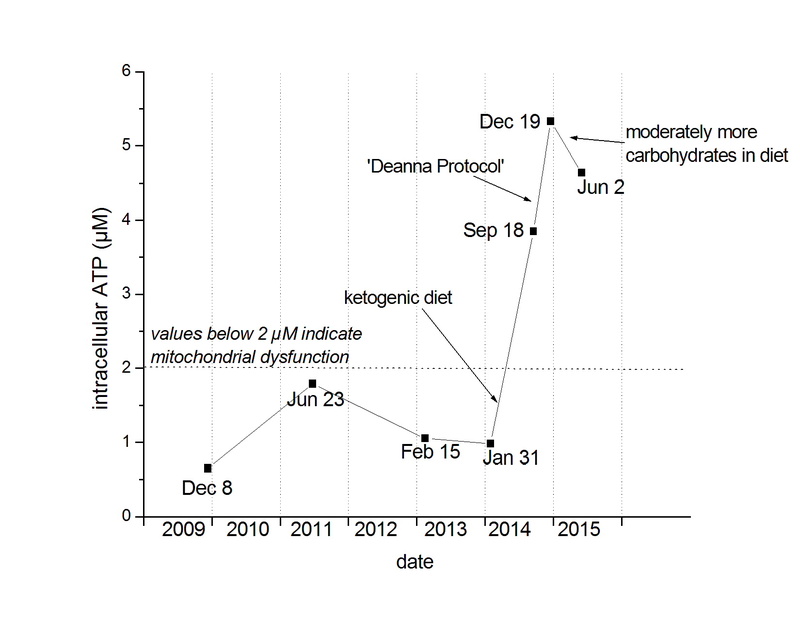 The ketogenic diet (or Paleo Eating) can be a good alternative 9,10 and has indeed led to positive results in an ALS mouse model 11. Ketogenic diet induces ketosis, a physiological condition after prolonged fasting or extremely low carbohydrate intake (don’t confuse with ketoacidosis which is pathological and life threatening). Ketosis means that the body starts to produce ketone bodies by fatty acid degradation. These are small molecules that may serve as an alternative to glucose as energy source, particularly in the brain. Under ketogenic conditions ketone bodies are synthesized from all kind of fat, but particularly the degradation of medium chain triglycerides (MCT) delivers high amounts. This is why coconut oil, which is rich in MCT, may be a superior source of energy compared to butter fat. For ATP production ketone bodies simply bypass the impaired glycolytic pathways and thus deliver the fuel that is needed. The term Paleo Eating refers to the fact that our stone age ancestors were restricted to low carbohydrate diets before agriculture was invented. To provide an example for effects of ketosis I am adding the figure below. I’m a PALS for 10.5 years and the figure shows the results of my analyses of intracellular ATP over the past six years. Intracellular ATP is a measure of cellular energy production. What makes this figure worth looking at is, that it covers the period when I was on an average diet with ‘normal’ amounts of carbohydrates (2009 – March 2014) and the period when I switched to ketogenic diet and strictly banned carbohydrates from my food (April 2014 – April 2015). On a normal diet the results indicate that my cellular energy (= ATP) production was seriously impaired with values below 2 µM (micromoles per litre). Only after I strictly avoided the consumption of carbohydrates intracellular ATP levels increased more than 5-fold. In addition to ketogenic diet I started to take the main components of the ‘Deanna Protocol’ (see ref. 12 for details) in October 2014. A further ATP increase in December suggests a correlation but this should be interpreted cautiously. Also caution is advisable when looking at the most recent value. I started to eat moderately more carbohydrates again in spring 2015 and in June 2015 the ATP value was slightly lowered. Whether or not this is correlated must remain speculative. The question could probably be answered by doing significantly more measurements but that would be a costly undertaking. Energy supply in PALS is of course more than eating fat instead of carbohydrates. The cellular systems responsible for ATP production require optimized conditions for proper function. This includes pH balance, calcium homeostasis, availability of vitamins and other enzyme cofactors, control of the deteriorating effects of oxidative stress by radical scavengers, or detoxification. Awarenes of what to eat and what not plays an important role, together with the supplementation of minerals, vitamins and other nutrients. 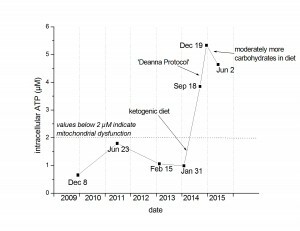 Despite this impressive rise in ATP production I have to admit that I did not experience any muscular improvements since I started with the ketogenic diet and my disease still slowly progresses. Nevertheless have I observed some positive effects, e.g. moderate weight gain and overall less fatigue. As regards clinical chemistry, there were no abnormal results in conventional blood analyses, including lipids and cholesterol. Only a transient increase in some liver enzymes was observable in the first two or three months. I will continue with my ketogenic diet and I encourage anyone who is willing to accept the necessary constraints also to try it. Shimizu T, et al. 2011. Hyperosmolar hyperglycemic state in advanced amyotrophic lateral sclerosis. Amyotroph Lateral Scler 12, 309-311. Pradat PF, et al. 2010. Impaired glucose tolerance in patients with amyotrophic lateral sclerosis. Amyotroph Lateral Scler 11, 166-171. Dr. Torsten Hahn is a trained biologist specialized in environmental risk assessment and regulatory ecotoxicology. He has 10+ years research experience and is author and co-author of numerous scientific articles and book chapters. In November 2004 he recognized first ALS symptoms and was diagnosed four years later with ‘probably ALS‘. 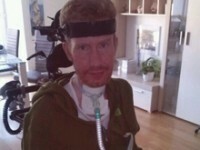 Regarding ALS he is interested in metabolic and nutritional aspects of this disease, as well as in the potential role of environmental toxins, particularly amalgam. Beyond physiology his interests cover psychosomatic and spiritual origins of disease.